Brewer Description: (from website) Aged for three months in Wild Turkey® Bourbon barrels, this luxurious stout has a deep ebony hue and a beautiful mahogany head. The woody, vanilla-like notes imparted by the barrels mingle with aromas of fresh baked bread, toffee, and espresso and envelop the rich chocolate and roasted barley flavors with a fine bourbon character. Intro: A 650ml bottle with no clear bottled on or best before date. 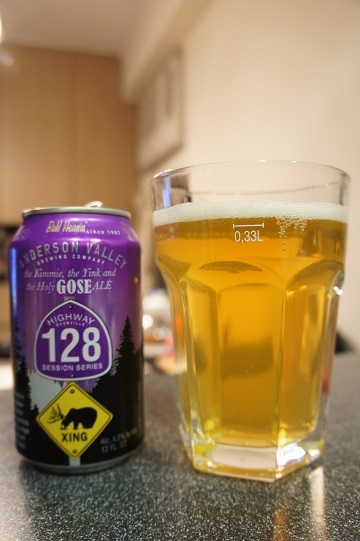 Poured into an Anderson Valley ‘can’ glass. Appearance: Dark brown to black in colour with a big almost four finger tanned head that had pretty good retention and left some lacing. Aroma: Roasty, chocolate, bourbon, vanilla with hints of coffee and oak. 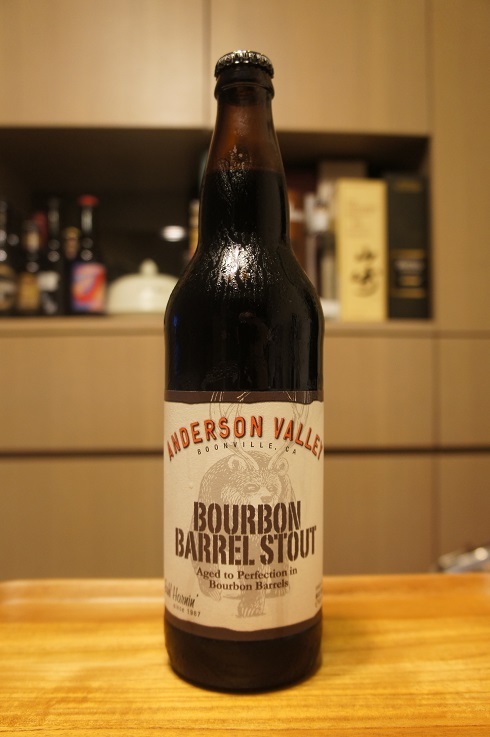 Taste: Bourbon sweetness and oak with only hints of any roast, chocolate or stout in the background. The roastiness comes out more as it warms, but in the end still not enough for me. Overall: Too much bourbon and a lack of stout identity for me. For the amount of bourbon, body was also lower than I prefer. Other Notes: Malt – Pale Two Row and Malted White Wheat. Hops – Bravo. 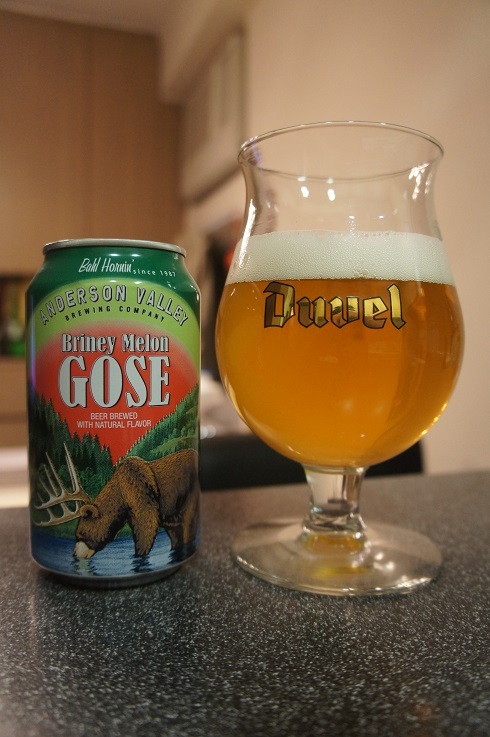 Brewer Description: (from website) Born from our passion for experimentation, our Briney Melon Gose boasts a thirst-quenching tartness that is perfectly balanced by subtle watermelon flavors and aromas. Gentle additions of sea salt create a refreshing harmony between the acidity and fruity sweetness leading to clean, dry finish. Intro: A 12 fl oz can with either a best before or canned on date that is not legible but should still be good. Poured into a Duvel tulip glass. Appearance: It poured a slightly hazy golden colour with one finger white head that dissipated quickly but left some stringy lacing. 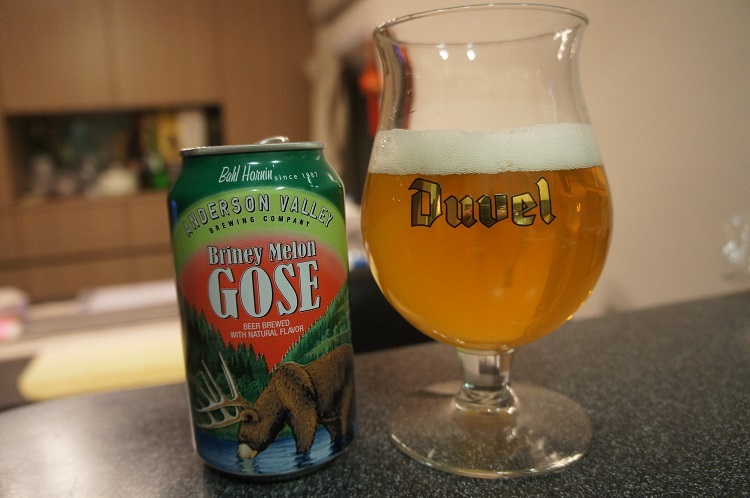 Aroma: Lightly sour, a bit tangy with a hint of honeydew melon. 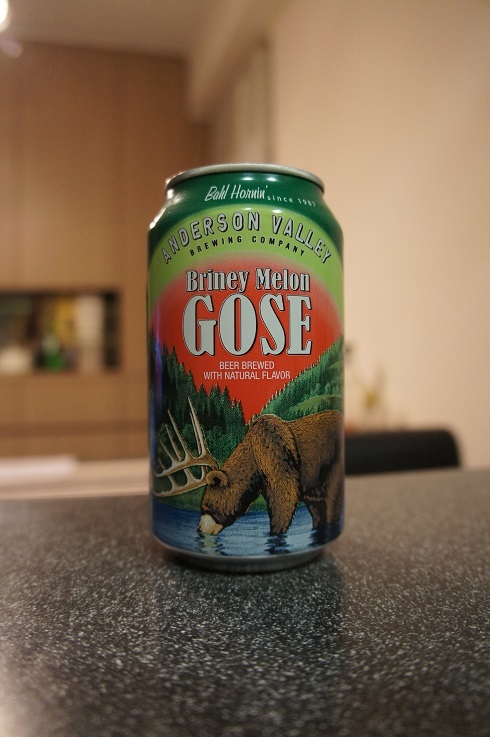 Taste: Salty, definitely salty and lightly sour before a nice refreshing kick of honeydew melon and watermelon. The finish is a light lasting sourness. Overall: I wasn’t impressed with my first sip, but I think I grew to like it more and more. Refreshing and easy to drink. Brewer Description: (from bottle) Burnished gold hue with a persistent, rocky white head. Floral, spicy aroma redolent of lilacs, white pepper and Bartlett pears with undertones of blueberry honey and roses. A pleasant balance of crisp bitterness with a clean malt profile adorned spicy, herbal hop flavors lasting into a dry, refreshing finish. 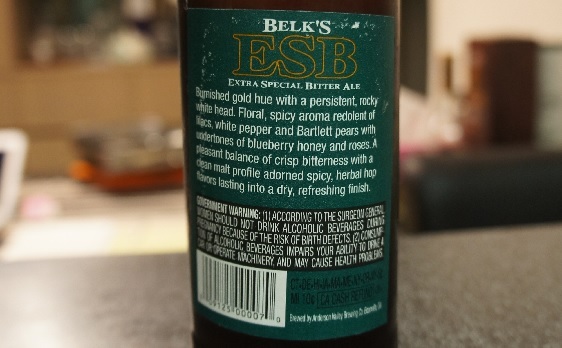 Intro: A 12 fl oz bottle with no visible best by or bottled date and poured into a pint glass. Appearance: Poured a slightly hazy orangey copper colour with a one finger off white head that dissipates within a minute leaving some stringy lacing. Aroma: A bit weak but what little I do get is caramel malts, some fruitiness like plum, pear, apple sauce and orange plus hints of mineral notes. Taste: Strong caramel sweetness beginning and citrus grapefruit bitterness finish with hints of pine, grass and pepper in between. 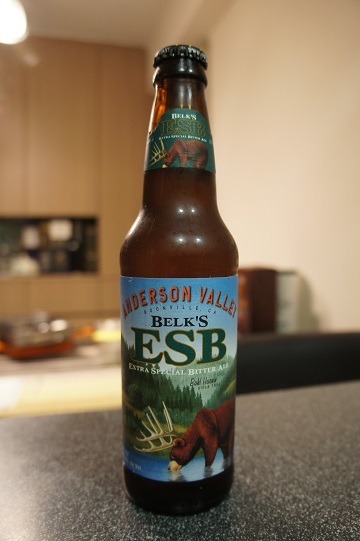 Mouthfeel: Medium bodied with low carbonation and dry finish. Overall: This was decent but nothing special. I think I may prefer it more if it had a little less of the caramel sweetness. Other Notes: Malt – Pale Two-Row, Malted White Wheat. Hops – Bravo. 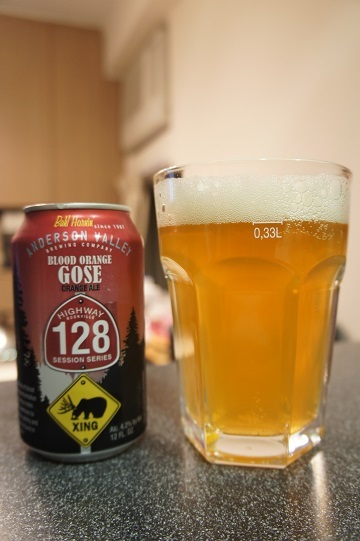 Brewer Description: (from can) Copious additions of blood orange during fermentation impart tangy citrus notes and a slight sweetness to compliment the salinity and tartness typically found in a Gose style ale. Intro: A 12 fl oz can poured into a pint glass. Appearance: The beer poured a slightly hazy golden orange colour with a two finger white head that dissipated quickly with no lacing. Aroma: Strong tangy citrus and candy like orange and lemon. 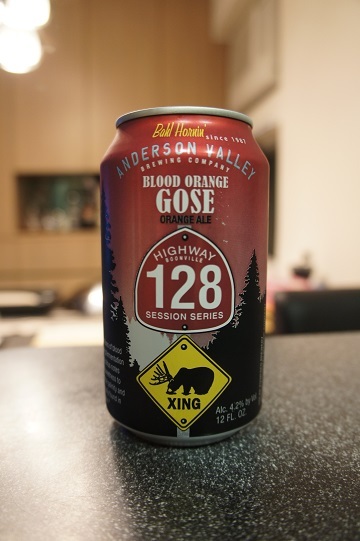 Taste: Tart and tangy sour orange with a salty finish. 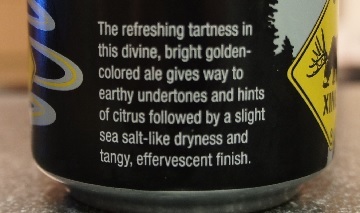 Mouthfeel: Light bodied with medium carbonation. Overall: I enjoyed this. It’s a great drink for a hot summer day as it goes down easy and is very refreshing with its tart, tangy and salt finish. 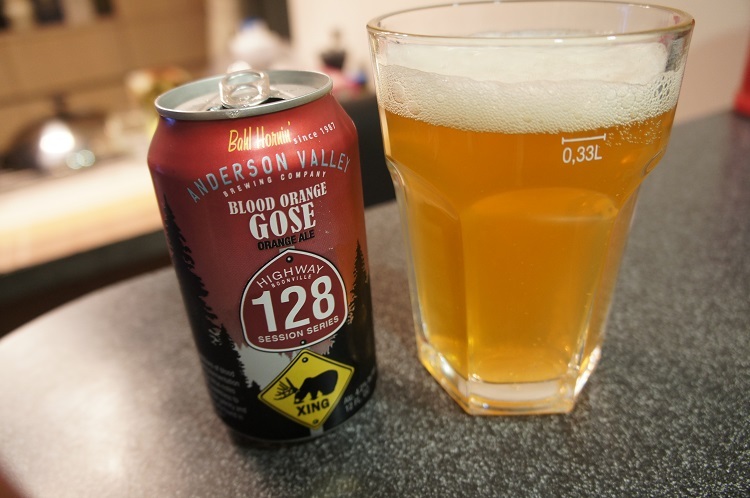 I prefer this over Anderson Valley’s regular Gose. 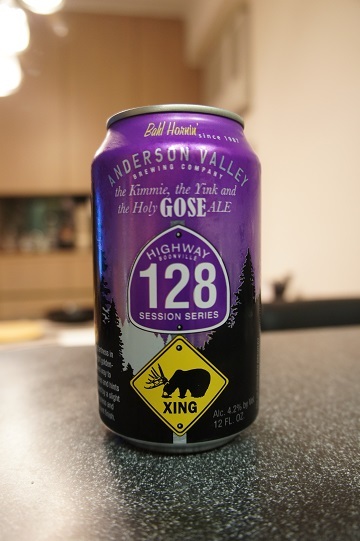 Brewer Description: (from can) The refreshing tartness in this devine, bright golden-colored ale gives way to earthy undertones and hints of citrus followed by a slight sea salt-like dryness and tangy, effervescent finish. Appearance: The beer poured a clear golden straw colour with a one finger white head that dissipated quickly. Aroma: Aromas are mainly bready, tart, sour, lemon. There is also a slight dank finish. Taste: First a doughy malt flavour, followed by tart, lemon, sour and salt. 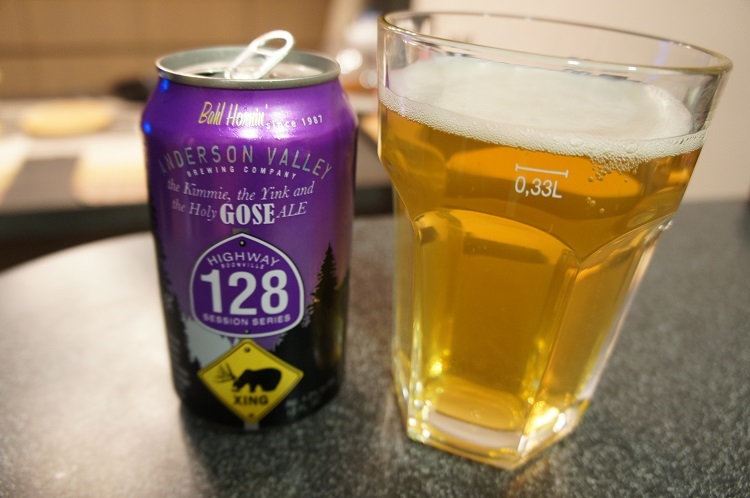 Mouthfeel: Light to medium bodied with medium to high carbonation. Overall: This was not bad as the tartness is refreshing. It’s also easy to drink. 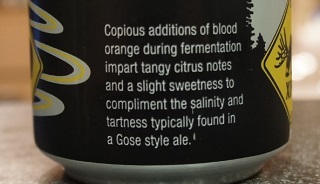 However I tried the blood orange version first and easily prefer that over this one.